Researchers from the ALICE experiment study the interaction between particles that are involved in high-energy collisions between atomic nuclei in the LHC particle accelerator. In such collisions, hot material is produced that consists of quark and gluons: a quark-gluon plasma. One of the techniques used to study the plasma is to measure quarks and gluons that leave the collision area with a high momentum. In the quark-gluon plasma, high-energy particles will lose energy by emitting gluons. Researchers can use this process to determine characteristics of the quark-gluon plasma, including the density, temperature and number of effective degrees of freedom in the plasma. The researchers cannot observe quarks and gluons directly in an experiment, because these particles are always bound to form so-called hadrons (for example, pions, kaons and protons). Nevertheless an experimental signal from high-energy quarks and gluons can be measured. The high-energy particles form jets, groups of several hadrons with a high momentum, which move in more or less the same direction. The ALICE researchers use algorithms to reconstruct the jets from the particles detected in the detector. For the jet reconstruction, the researchers use, for example, an opening angle of 0.3 radians, about 17 degrees. Particles that leave the collision at an angle less than the opening angle of the jet cone are included in the calculation of the jet energy. Particles that fall outside of the cone are not included. To quantify the interactions with the quark-gluon plasma, the researchers determine the ratio between the number of jets in central collisions and the number of jets in peripheral collisions, for which the atomic nuclei do not collide head-on but have an oblique impact. For central nuclear collisions this ratio is smaller than one, which indicates that a large partof the gluon radiation falls outside of the jet cone. The effect decreases when fewer central collisions take place, when the reaction area is smaller and when the temperature and density are lower. 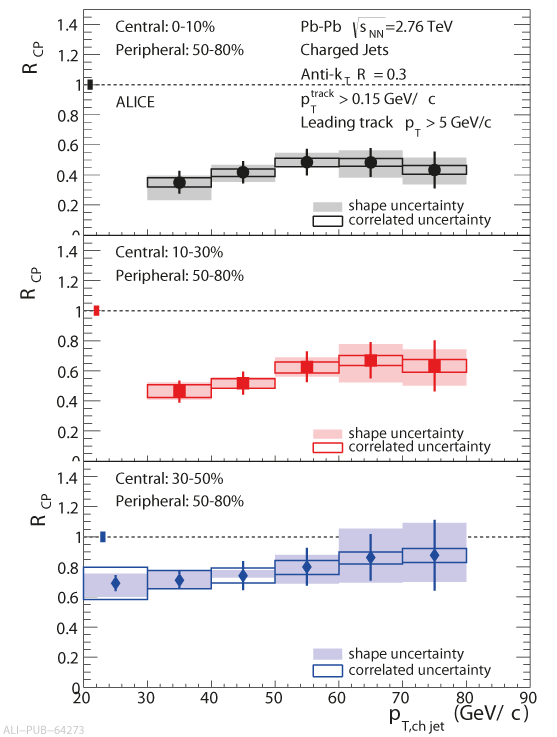 These new results from ALICE reveal that the gluon radiation is often produced at large angles, which is contrary to the theoretical expectation. Sketch of a high-energy particle that emits two gluons. The radiation under a large angle (green) falls outside of the jet cone and is not included in the jet energy, whereas radiation at a small angle (red) falls within the cone and is included. Nuclear modification factor RCP (the ratio of the number of jets in central collisions and the number of jets in peripheral collisions), as a function of the momentum pT of the jets. The jets are reconstructed from charged particles in a cone with a half top corner of R=0.3 radians (about 17 degrees). Top: central collisions, bottom: peripheral collisions.